Holly Petraeus, former CIA director’s wife of 38 years, has reportedly threatened David Petraeus with divorce after she was left “humiliated” by his affair with his biographer, Paula Broadwell, it has been claimed today. Holly Petraeus is reportedly “furious” about the affair, which forced her husband to resign from the top of the CIA ten days ago, and is demanding to know how many other women he has shared trysts with throughout their marriage. “She can’t turn on a television, go online or open a newspaper without being bombarded by the latest revelations about his cheating,” a source told the National Enquirer. The source claimed Holly Petraeus has suspicions that her husband had an affair with Jill Kelley, the Florida socialite who sparked his downfall after tipping off the FBI about threatening emails from Paula Broadwell. While David Petraeus denies they have ever been involved, Holly Petraeus is uncertain and keeps demanding to know how many other women he has cheated on her with, the source said. Jill Kelley has also denied any wrongdoing and said in a statement she was simply a friend of David Petraeus, whom she met through her work at MacDill Air Force Base in Tampa. Holly and David Petraeus attended lavish garden parties at Jill Kelley’s Tampa, Florida mansion, where she lives with her husband, their three children and her twin sister, Natalie Khawam. 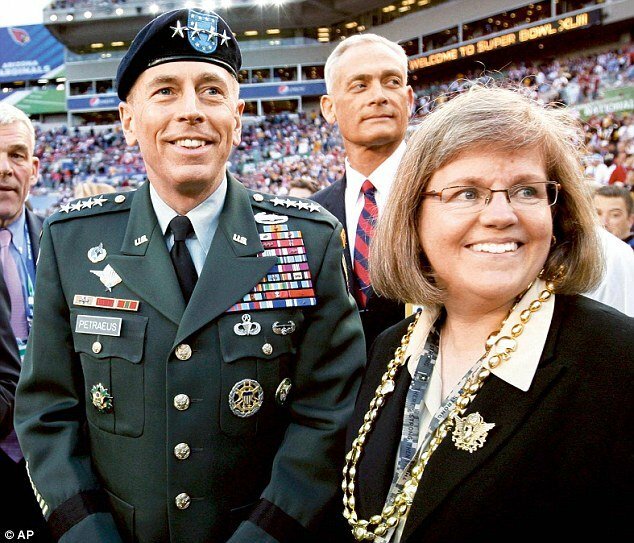 The Petraeuses have been married 38 years after meeting on a blind date when David Petraeus was a student at the military academy at West Point, where Holly’s father was the superintendent. David Petraeus graduated in June 1947 and the couple married the following month, before going on to have two children, Ann and Stephen, and travelling throughout the world with his work. Despite moving 24 times in 38 years, Holly Petraeus has also built her own career. She became a volunteer, performing military and family support roles on bases, before working with service members as a financial advocate to ensure they were treated fairly by businesses. In 2011, Holly Petraeus was appointed to the newly-created Consumer Financial Protection Bureau as head of the Office of Servicemember Affairs, a post she still holds. Holly Petraeus’ threats of divorce come little more than a month after she and her husband were the picture of unity at their daughter’s wedding – three months after David Petraeus’ affair with Paula Broadwell had come to an end. But on November 9, he stepped down from the CIA after the FBI uncovered his relationship with Paula Broadwell. The affair was discovered after Paula Broadwell sent a string of “threatening” emails to military party planner Jill Kelley, whom she deemed a threat. According to friends, Jill Kelley considered some of the anonymous messages death threats, after Paula Broadwell vowed to make Kelley “go away” – and the concerned housewife contacted the FBI. The anonymous emails contained classified information about David Petraeus’ whereabouts and, thinking there had been a potential national security breach, the FBI was forced to investigate. During their probe, they traced the emails back to Paula Broadwell and also uncovered emails revealing her months-long affair with David Petraeus, whom she had first met as a student in 2006. In interviews and her biography of David Petraeus, All In, Paula Broadwell lauded Holly Petraeus as a “wonderful source of information” and revealed that she had read the book and enjoyed it. In the book, Paula Broadwell recounted details from dozens of hours of interviews between Holly and David Petraeus in a description of how the couple met and fell in love. Paula Broadwell described the relationship as virtually unbreakable – while at the same time carrying on an illicit affair with David behind Holly Petraeus’ back.